Meet George. He's a little camera shy. When I'm "far" from his home, he'll relax and swim about. He seems to sense when I'm coming up to him with the camera in hand, then goes into hiding. George came home with us after DD & I stopped by this pet store just to look. I already had a small 2 gal aquarium from aeons ago, so all I needed was food, water conditioner, 2 plants, gravel, and of course George. He didn't seem very happy in his pint-sized plastic container (which contained unnatural blue colored water!) and seemed much happier once he moved into his new home. He could finally swim around! DD went through several name possibilities, gender specific and non-gender specific. I think she has settled on George, but we'll see as the week progresses whether the name George has stuck. I need to go back to the pet store to look at food alternatives. The pellets will be fine for his main diet, however a "treat" now and then would be nice too. I also wanted to look at one more decorative item, something like a "cave" where George can retreat to when he wants more privacy. 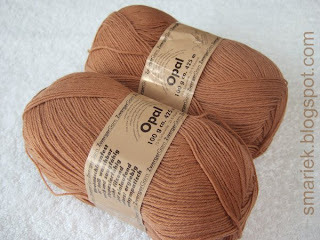 I know it must sound silly when there is only a 0.5 mm difference between the two sizes, however there is a world of difference that can be felt in my hands while I'm knitting with the "big" needles. Alright, I must admit that there was another reason for starting this blue sock. 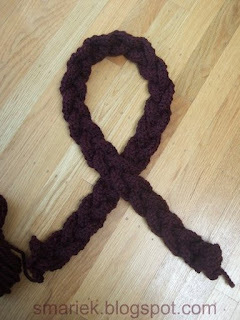 I was running out the door with DD to go to the park and wanted to bring a mindless knitting project with me. So I grabbed this ball plus some needles and cast on while at the park. 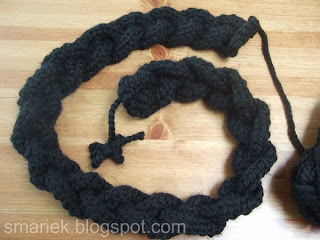 I didn't want something complicated that would require referring to a pattern (good thing too cuz it was windy that day and any papers would have been whooshed away), so I just started a basic cable after finishing the toe section. 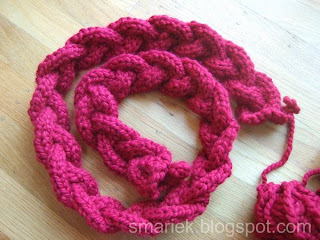 There is nothing easier than cabling every 4th row, and knowing which way to twist the stitches by reading the knitting. 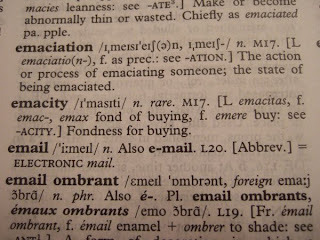 Really ,this is much easier than it appears. 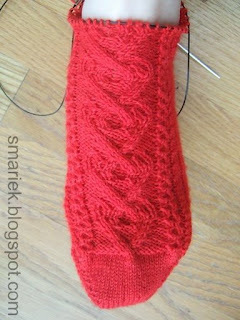 I'm not sure I like having such a long stockinette toe section before beginning the pattern. I suppose I could have started the cables earlier (viz. in the toes section). I'm still undecided. 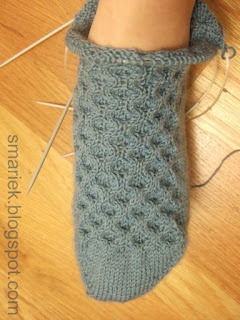 I think it would look better with the pattern running all the way down (or partway down) the toe. On the other hand, I'm also worried about the the added bulk in the toe section created by these cables. 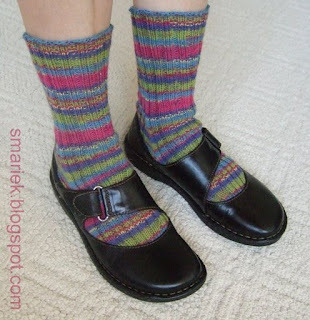 I'm leaning towards keeping the toe plain stockinette. Am I difficult to please? 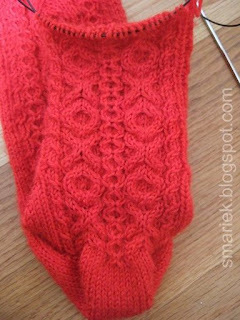 I feel like I've reached the crossroads again and must decide whether to continue northwards on this sock or rip back southwards a bit. Right now I have knit about an inch past the completed gusset. I'm not very satisfied with how it is fitting around my ankle so I am in the process of working increases in a very sloppy on-the-fly sort of way. This means I didn't sit down to plan for a seamless transition and the increases are not well placed. And the result? Holes everywhere! I've placed this sock on mini-time-out so that I can think about which path to take. I could rip back to the foot section and rework it northwards again. 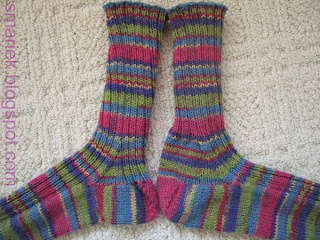 The easy thing to do would be to forge ahead, learn from my mistakes, and try to do better with Sock 2. Which would you choose? The rougher dirt path in 3.5" stiletto heels? Or the smoother paved path in well worn sneakers? One other thing I'm not too pleased with is my uneven tension. I was definitely loosey goosey in the foot section, then I tightened it up a bit after that. I was measuring a 1" section at one point and it come out closer to 7 spi ! Yep, that's loosey goosey. 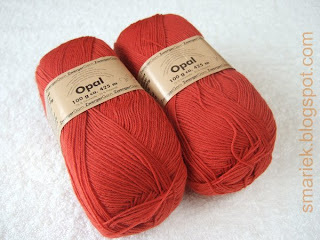 I sometimes feel like all I do is B&M about my knitting. I do have something nice to say about this sock. 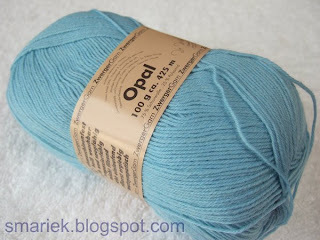 I love how soft this yarn feels. 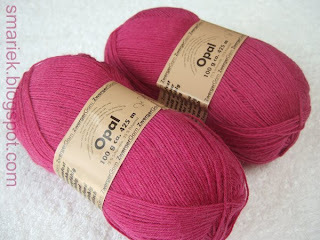 It is the same yarn I used for my blue socks and my pink socks, yet this particular colorway feels much softer! 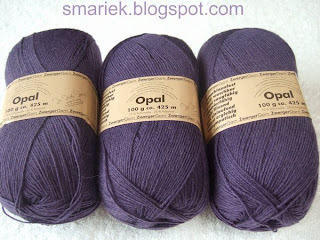 All 3 colorways are the same wool/nylon blend. 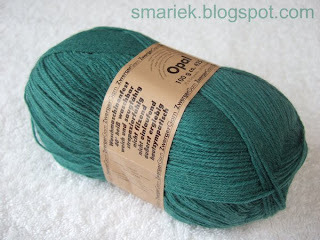 However I think this one has more of a "halo" on the yarn strands. Perhaps this has something to do with the softness. ?? 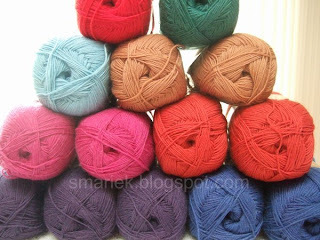 The knitted fabric also has nicer feel and drape, not as stiff as the other two. This colorway also seems more prone to snaging too. 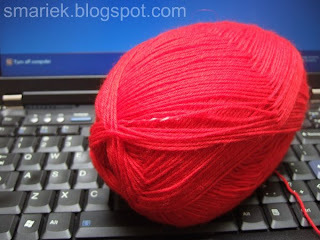 Well, I have started one other little knitting project last night, but I can't show you any photos until June. 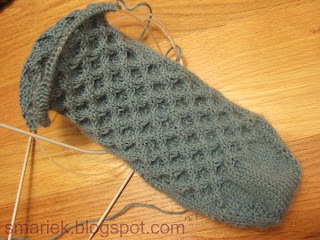 I am test knitting a mitt for Dianna (RavProfile here), who is designing the June KAL for this RavGroup. 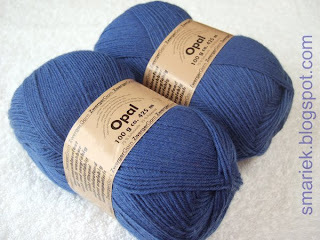 What I can tell you is that I am using this yarn in blue with 4.5 mm DPNs. 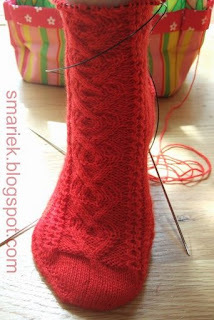 :-) Oh and the knitting seems to be moving along at Mach 2 compared to the socks. --. .-. .- .. -. ... / -.. . / -.-. .- ..-. . I've started caffeinating myself in the mornings again. 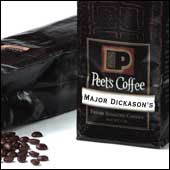 Right now I am enjoying a cup of P's Major's D's blend. Mmmm... good stuff! This store used to be within walking distance in my old town. I can't complain though, I am fortunate enough to be close to 2 stores in my new town. :-) Not walking distance, this is the burbs where you have to drive everywhere. I love my coffee grinder, it is small and does the job quickly/easily. I've had it for aeons and it is still working fine. However there is one thing I have learned... white is not a good color for a coffee grinder. You notice every speck of coffee that sticks to the outside surface like a magnet. Seems like common sense. What color is coffee? Of course this would also happen with a black one too, it'd just be less noticeable. Unfortunately I can't really justify replacing mine with a black one since it is still going strong after all these years. I watched the new Indy Jones movie last week. 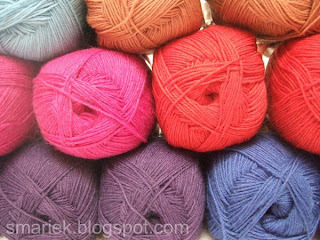 It's an easy film to watch, perfect for knitting to. 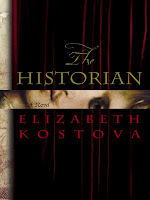 There's nothing really new about it, same old stuff, predictable, far-fetched at times, mildly entertaining if you go in without high expectations. HF is getting too old to do this sort of movie; the dude will be 67 in a few months. 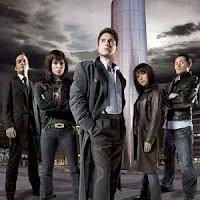 I am a little sad about nearing the end of this British TV series. The season is quite short, only 8 episodes. I have the penultimate episode (#7) Tivoed and there is one last episode coming down the pike. I kinda want to hold off on watching ep #7 so it doesn't have to end so soon. OTOH, I am looking forward to TW Children of the Earth beginning sometime this summer. Well, it's time to finish up my coffee, pay some bills, figure out what books need to be returned to the library, and see if I can find the correct filter cartridge for George's home. I really should go see what kind of tank heating options are available as George likes warm waters around 76° to 86° F. I'll probably end up getting some decorations and alternative foods (brine shrimp? 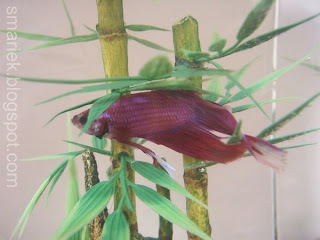 bloodworms?) for his treat. I picked up a little Mineraloid Gel a little while back. Just a few balls, some in my favorite colors and some in colors I normally wouldn't choose, but I was making an effort to break out of my color comfort zone. Ok, maybe more than just a "few" balls. I couldn't help myself! 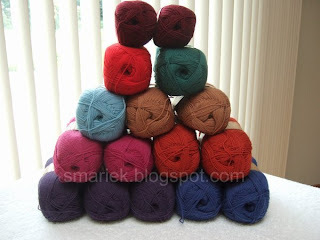 I just have an eee.ma.sih.tee for sock yarn. 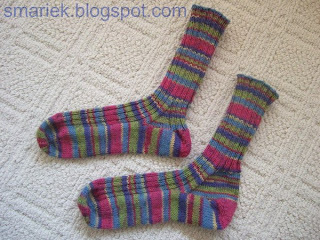 And I wanna knit socks!!! Some blues. I really like the darker one and prolly shoulda picked up more. Some reds. One is very bright; V saw it up close and commented on its retina piercing brightness. 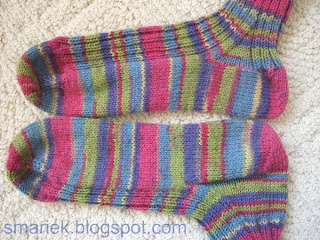 I'm currently using this for the socks you saw in progress here. The other is more rust or orange than I like. Perhaps I'll change my mind once it is knitted up. A green. Green has never been my color, so this will be gift socks to someone. A light brown. I was thinking it might be a good choice for a guy who doesn't want something too bright or colorful. Oh, and the 2 balls at the top of the stack is just some Re.gia Stretch. I have finished the 3rd bag strap, this one is for the burgundy bag. 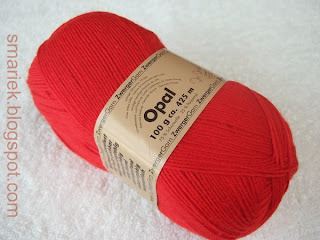 You can see the knitted handles for the red and black bags plus the fabric liners for all three bags over here. The ball is in V's court now, she will figure out how to attach these to the bags either before or after sewing on the fabric liner. 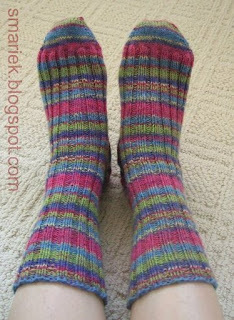 I do have one sock finished for Pair 4. It was a hasty finish at the cuff because I just wanted to get it over with. I like the front side. 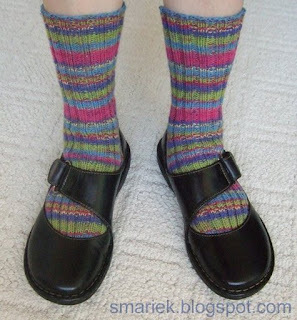 Sorry about the photos, it was not a good marriage of sock & lighting that day. Not satisfied with how the side looks. I think I'd like the XO motif to move away from the back and more towards the sides. 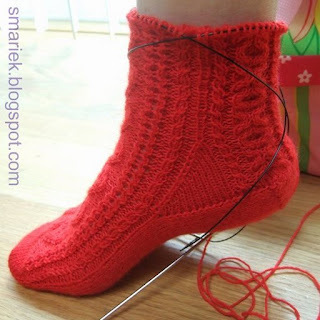 If you look at the photos of the back heel from the last post, you will see how snug it fits from how stretched out the knitting & cables appear. 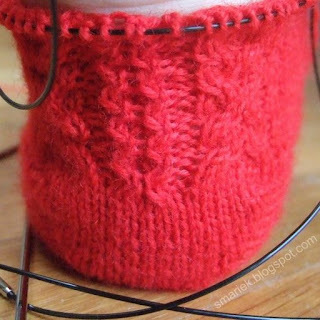 It was fitting snugly (not in a very bad way) around my leg near the ankles, and as I worked upwards, I decided to add a couple of stitches on the sides to help the top part fit my widening leg. This is why you see this odd cable twist come out of nowhere at the side (near the top). Very sloppily done indeed. 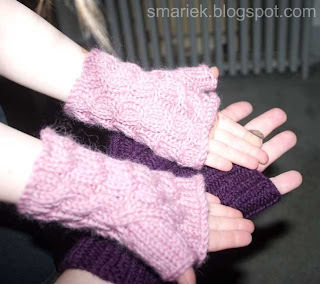 The front cuff section is similar to the mitts. In my haste to finish, I did not put much thought into the back cuff section and it shows. 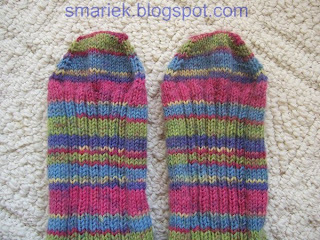 I have started Sock 2 with 4 extra stitches. 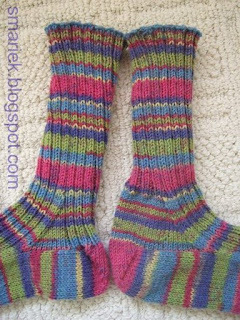 As a result of this change, I had to make a minor tweak to the small cable twist on the front side, and I redid the entire back because I did not like the way it was arranged in Sock 1. Slow progress here. 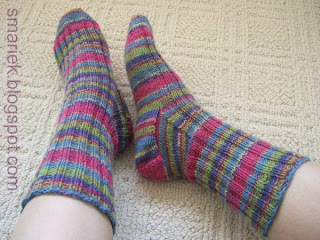 I thought I was done with the heel flap, then I discovered I had 35 sts! Where did that extra stitch come from? Oh! Right, I moved 1 st from the instep to the other needle so that I could start that needle with a knit stitch instead of a purl stitch. 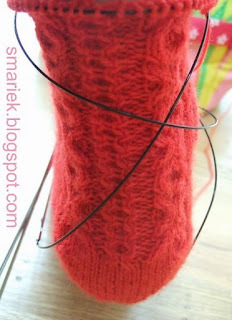 My bad for not paying attention and moving it back to the instep needle before starting the heel flap. 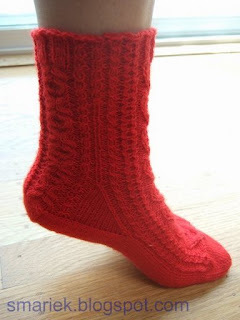 I've just finished reknitting the heel flap and will start the whole heel turn magic and gusset rounds when I have a good chunk of time to devote to it. V came by and brought this DVD with her. We watched it this afternoon and OMG it was sooooo hilarious!!! It was refreshing to hear humour with clean language.